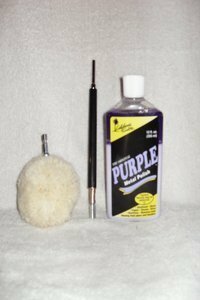 WE ARE PLEASED TO BE ABLE TO OFFER ONCE AGAIN THE 3″ WOOL BALL FROM LAKE COUNTRY, ALONG WITH AN 8″ EXTENDER AND PURPLE METAL POLISH. THE WOOL BALL HAS RECEIVED MANY COMPLEMENTS FROM MY CUSTOMERS FOR POLISHING RIMS, ETC. ONE OF MY CUSTOMERS HAS USED HIS FOR ABOUT A YEAR FOR MAINTAINING RIMS, AND HAS RECOMMENDED IT WITH PURPLE METAL POLISH. IT IS HIS PREFERRED COMBINATION FOR POLISHING MAINTENANCE.